The root of the ginger plant, Zingiber officinale, is used as a spice and as an ingredient in a variety of foods, drinks and even in perfumes and soaps as a fragrance enhancer. It is also widely used as a medicinal, and has been for over 2,000 years in both the Ayurveda and Chinese medicine traditions. 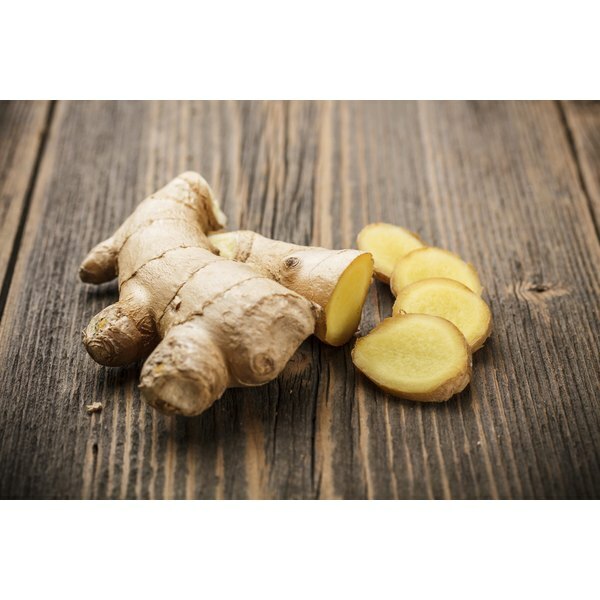 Ginger root is a relatively safe herb, according to MedlinePlus, but it is best to consult with a qualified health practitioner before using it for medicinal purposes. The ginger plant is native to the tropical parts of Asia, but it can be cultivated in other tropical environments, such as Jamaica, according to the website Medical Herb Info. Although the ginger plant does sprout leaves and flowers, the root, or rhizome, is the only part used, along with the stems, as a medicinal. The active ingredients, according to the University of Maryland Medical Center, are found in the volatile oils and phenol compounds, such as gingerols and shogaols, located in the root. The most common use of ginger root as a medicinal is for problems with the stomach, such as the nausea from motion sickness, gas, diarrhea, colic and morning sickness. It is also used for the nausea caused by chemotherapy or as the result of surgery. Ginger root is also used to treat pain, such as the joint pain caused by arthritis, menstrual pain, and general muscle soreness. In traditional Chinese medicine, ginger is also used to treat coughs, colds and as an anti-bacterial, which is why it is served with raw fish, such as sushi. Ginger root is considered relatively safe, but taking too much can cause irritation of the mouth, mild heartburn, diarrhea or excess menstrual flow in women. The UMMC suggests taking no more than 4 grams of ginger a day for adults and children over 2 years old. Pregnant women should take no more than 1 gram a day, while children under 2 years old should not take ginger at all. Consult your doctor or a qualified health professional before taking ginger root for medicinal purposes, particularly if you have gallstones, heart disease, diabetes or are pregnant. Ginger root may also cause problems if you are taking blood-thinners or high-blood pressure medications.